TAIPEI, TAIWAN, January 30, 2019 – Avalue Technology Inc. TAIEX: 3479-TW), a global embedded solution provider and an associate member of Intel® Internet of Things Solutions Alliance. 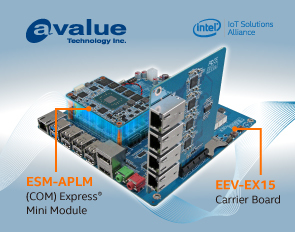 releasing Type 10 COM express® mini module - ESM-APLM and Carrier Board – EEV-EX15. an extremely small carrier board in a board size of 84mm x 55mm (just like credit card size) and is intended for low power platforms (TDP 6W and below). It is ideal for customers who need for small handheld devices, such as handheld devices (smart battery) for industrial, medical, transportation, and controllers for outdoor. 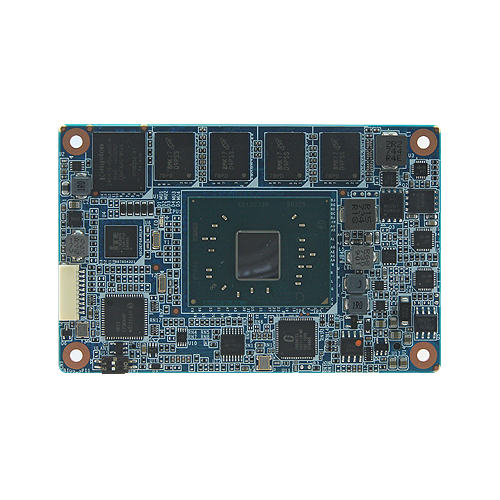 Type 10 Computer-on-Module (COM) express® mini module, ESM-APLM, is equipped with the Intel® Apollo lake Pentium® N4200 2.5GHz / 6W and Celeron® N3350 2.4GHz / 6W SoC Processors. ESM-APLM supports DDR3L memory support for up to 8 GByte at 1866MT/s. Extensive I/O 1 4 (Supports x1, x2, x4, optional 1 PCIex4 while removing Ethernet) compliant to PCIe Gen2 5.0 GT/s, 2 x SATAIII 6 , 2 x USB 3.1 (Gen1) and 8 x USB 2.0, 5.1 (optional). ESM-APLM supports newest Intel® Gen9 Low Power graphics, up to 4K resolution and H.265 codec. In additional, it supports single channel 18/24-bit LVDS from -to-LVDS IC CH7511B supports up to 1920 x 1200 @60Hz. 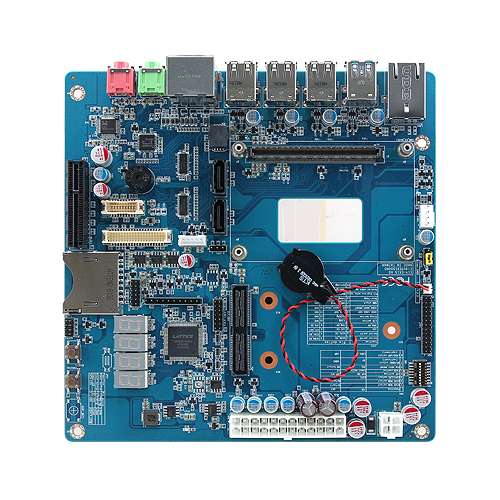 Mini ITX COM Express Type10 Carrier Board, EEV-EX15, is designed with PICMG® COM Express® Revision 3.0 supports Type 10 Mini module, suitable for Avalue’s and others Type 10 COM Express® Compatible CPU modules, also enable customers to development on quickly and easily. For the I/O, EEV-EX15 support including LVDS x 1, eDP x 1, DP x 1, HDMI x 1, 2 x SATAIII, 1 x COM Express connector, 6 x USB2.0, 2 x USB 3.1 (Gen1) (contain 2 x USB2.0), 1 x LAN, 1 x SDIO, 1 x IET, 1 x FAN. For the audio interface, it supports MIC in and line out. 1PCIe x 4 Slot supports two kinds of PCIe expansion boards for testing, one is for PCIe and one is for LAN. Technology (TAIEX: 3479-TW) is a professional industrial computer manufacturing company, who is dedicated to developing the x86 and RISC architecture products, including embedded computers, single board computers (SBC), Systems-on-Modules/ ETX (SoM/ ETX), industrial motherboards, all-purpose panel PCs products, Mobile solutions, Industry 4.0 solutions, Retail solution and various IOT ready products. Having expanded, Avalue offers its expertise on PCB/ Assembly/ BIOS version control and all types of after-sales services. An ISO 9001:2008, ISO 13485:2003, ISO 14001:2004 and OHSAS 18001:2007 certified company; Avalue offers assurance to customers in every aspect of business. With headquarter located in Taiwan, Avalue has global subsidiaries, including offices in Shanghai, New Jersey, California and Tokyo. In addition, Avalue Technology operates an extensive distribution network to accommodate and serve customers all around the world.